December 17, 2015 by Venky. Indian Terrain Tour of Nilgiris – 2015 – Day 2 – Mysore to Madikere! It was a long and tiring ride to Mysore(176km). But by dinner time when the day’s competitive section results were announced, the weary relief of finishing the long day was quickly replaced by the excitement of trying to find how each one fared compared to the others. That quickly started frantic discussions on the route profile of day2. Plans on how to move up the rankings were being charted amid a lot of roadie talk. 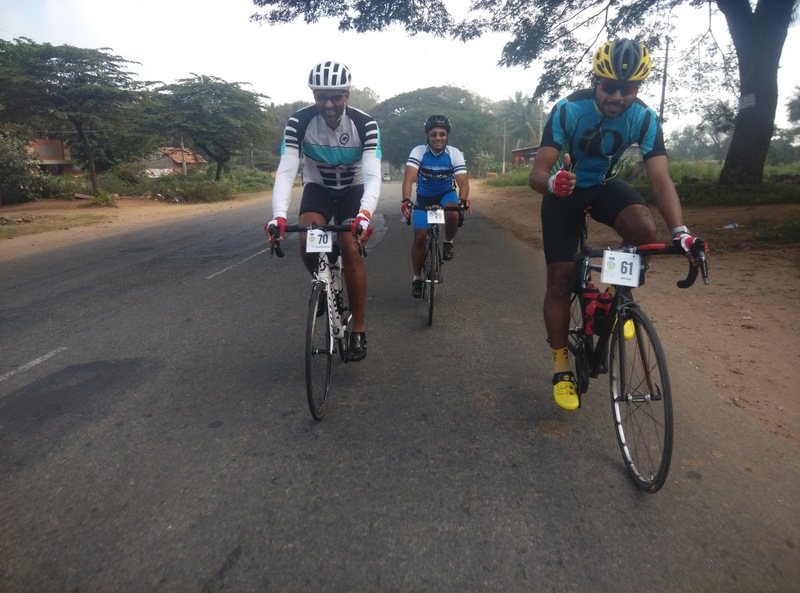 The route from Mysore to Madikere is a 120km ride on rolling terrain with a 10km climb at the end. The ride out from our hotel KVC International was lead by the day’s blue jersey riders from each category. We slowly rolled out of Mysore and got onto the highway towards Madikere. The light tailwind kept us moving at a nice pace. A big bunch formed around Nils and Richard who were chatting about and getting to know each other. But once the niceties were over the pace began to rise at a very imperceptible rate. I calmly backed down and the let the bunch go. I began to spin the small gear up the gentle slopes and I was joined by my roommate, Sumit Kumar. Siva Reddy and Pullela Gopalakrishna from Chennai joined us as well. Siva was unable to start the tour on day one due to some emergency work and took a car to reach Mysore and started his tour from day2. He did TFN 2012 and returned this year. We kept rolling at a sedate pace. The weather was nice and the route quite scenic. The chirping birds provided nice background music to drown the smooth whirr of our wheels in the morning calm. We hardly said a word to each other and just got immersed in the calmness as we kept rolling at an easy pace. I kept counting the number of caterpillars by the side of the road instead of counting butterflies. Catching them young, I guess. The roads were smooth and always going either gently up or down. As we got closer to Kushalnagara we could see a lot of Buddhist monks. There is a second biggest Buddhist Monastry after Dharmashala near Kushalnagar. We got to see various colored flags by the roadside and the maroon flowing robes were everywhere. My company for the day! As we were approaching Suntikoppa, after we entered a reserve forest section, I was planning to warm up for the competitive section which starts just outside Suntikoppa at 104km. But I was suddenly feeling low on energy and decided to stop by the roadside and sit in shade of a tree for a bit. Sumit, who was with me stopped and used that time to click a few pictures. I sat and took my time eating an energy bar and we started riding back. I did a few warm up drills on the inclines and reached the competitive segment start only to receive the news that we had to wait since there was a traffic pile up on the climb with a bus crashing while coming down the hill. Apparently, Nils got stopped during his race due to that pile up. I decided to cool down a bit by taking a nap under the shade of a tree instead of worrying about the race. That little powernap(may be, it was just for a couple of minutes but it certainly felt longer) was quite rejuvenating. By the time I woke up, the traffic was apparently cleared and we got the green signal to start the race segment. I decided to ditch the warm up and just start riding with a calm mind. We rode this climb in TFN-2011 and TFN 2012. So, I had a vague bit of idea on what to expect. It is not really a climber’s climb. It doesn’t allow you to get into any sort of rhythm as there are quite a bit of flat and downhill sections amid some steep pitches. You will end up riding at 10kmph one second and in the next few seconds you might be riding at 40kmph. It is difficult to get into any sort of rhythm. Since I have a 32-11 cassette, I decided to just big-ring it as it is easier to keep shifting at the back versus trying to shift from big to small chain rings frequently. I was afraid of the 10% and steeper gradient sections but decided to take my chances at the risk of completely losing momentum. I was able to quickly shift and spin fast through the flat and downhill bits and feverishly shift up when the road suddenly kicked up. The initial couple of kilometers helped me warm up and the heart rate was up. I was able to put out some power on the inclines. But the constant variation in the gradient was a bit difficult to manage. After a bit I just started using the downhill and flat stretches to recover and work on climbing stronger. The sweat was pouring down with the sun beating down ferociously. With 3kms to go, I was not sure if I could keep up the pace. But thankfully, a couple of flat sections helped me recover. The last km was all flat and quite fast and loopy. The fast bits were quite technical and you could easily go off the road if you miss the line. I had to brake a bit during the last kilometer to correct the line so as not to ride into the oncoming traffic. It was a relief to finally cross the finish line in 25:45. In Female category Belinda added 10 minutes to her lead and pretty much clinched her position at the top of the GC. 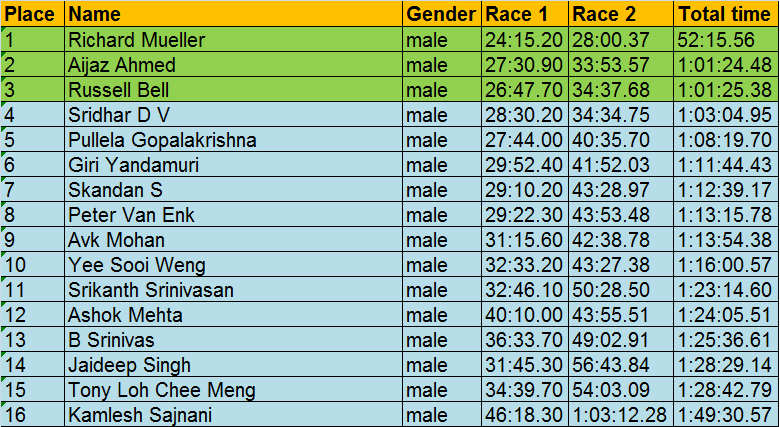 Divya Chandran is behind her at 2nd followed by Woo Bee Chin at 3rd. 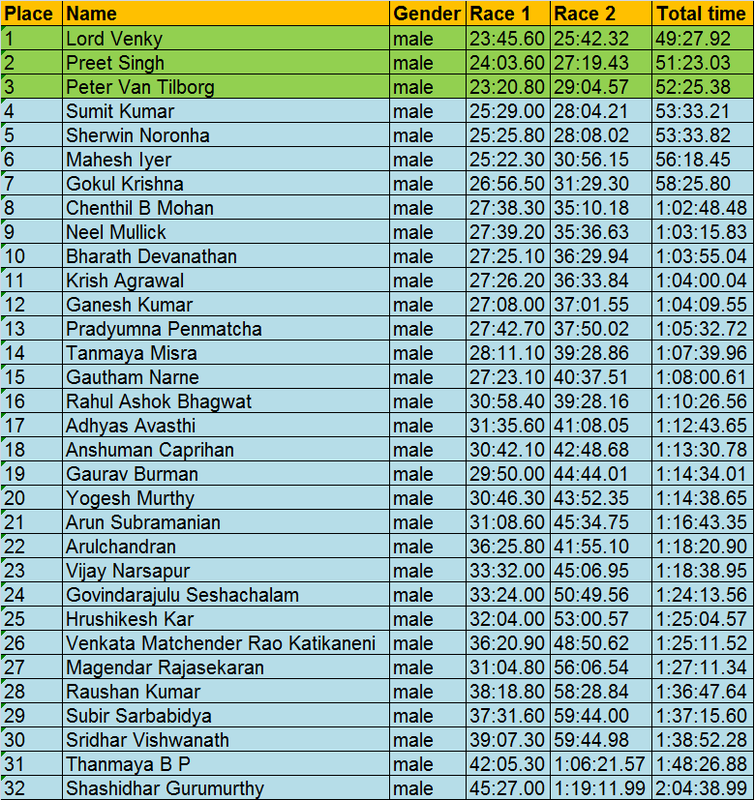 In Under 35 category Nils maintains his stronghold of the Blue jersey while Rajat holds onto his second place. 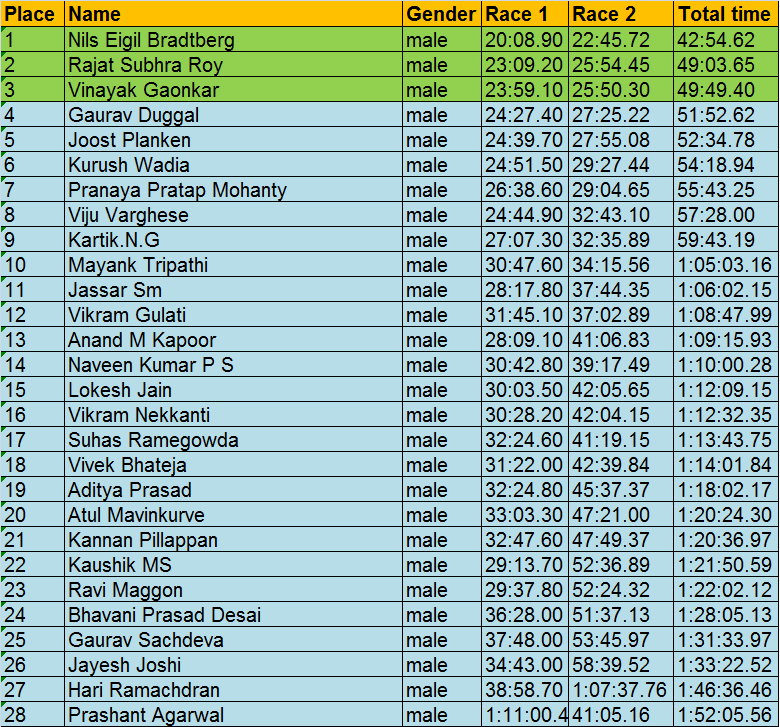 Vinayak is 46 seconds behind Rajat at 3rd place overall. Both did a very good climb to put some distance between them and the rest of the field below. Under 35 GC after Day 2! In Veterans(45+) category, Richard managed to put more time on his competitors on the climb and almost secured his Blue jersey. Aijaz moves up to 2nd place and leads the 69 year old Russell Bell by less than a second. It could be an interesting duel between them in the coming race sections. 45+ GC after Day 2! In Master’s category, I somehow managed to do a second fastest climb for the day(fastest being Nils’ climb), and take the lead overall and the Blue Jersey. Preet Singh moved from 3rd to 2nd with an impressive climb while Big Pete moved to 3rd after a day in Blue. Masters GC after Day 2! It would be interesting see how the GC pans out during the next two days of flattish race sections. Now that I have the Blue Jersey, I have no choice but to try and do well for the rest of the competitive sections. Richard Mueller and Belinda Mueller are a German couple who came to India 20 years ago and never left. They settled in Goa where Belinda is a practicing psychiatrist. The couple have been into endurance riding for a few years and are regulars in the Goa brevet circuit. Belinda has always been riding a hybrid bike with a basket, mudguard and the works. 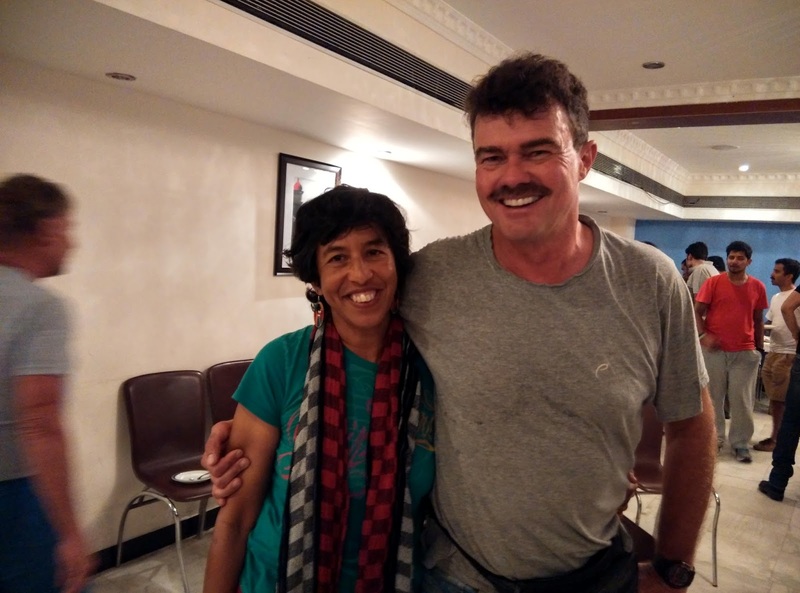 She completed 1200 km rides thrice on that heavy bike and Richard completed a couple of 1200km rides himself on his road bike. When they signed up for the Tour of Nilgiris, Richard forced her to buy a road bike. The Blue Jersey Couple, Richard and Belinda Muller! Although she bought the bike she just kept riding her hybrid because of the fear of the road bike. Yeah, apparently even psychiatrists have their share of fears. So, with two months to go for TFN, Richard sneakily removed the chain from her hybrid. She didn’t have a choice but to take her road bike out and start getting used to it. The fun couple have ridden themselves to the top of the podium on the first day of TFN. Two days into the tour both of them are already talking about returning to the tour next year if they are allowed. Of course, the organizers wouldn’t dare to refuse the blue jersey wearers an entry. Would they? Belinda is all praise for the volunteers who make the huge machine of TFN go like clockwork with their tireless efforts behind the scenes ensuring that the riders have to think about nothing and focus on enjoying the ride. She conveys her heartfelt thanks to each one of the volunteers! Tomorrow’s route to Sultanbathery is a long(156km) and super rolling terrain. If the weather is as hot as today, it is going to be as tough as the stage to Kalahatty if not more. It is better to not take too many breaks and complete the ride as quickly as possible. The 20km competitive section after 104km is also going to be very interesting. It is going to be all about conserving, hydrating and refueling well to survive and do well on a tough day. Previous Indian Terrain Tour of Nilgiris 2015! Day 1- Bangalore To Mysore! So nice to read your daily musings. It's really a pleasure, even from my hospital bed. Hope to be able to cycle again one day, otherwise I am just enjoying your reports. Nice, everyday I wait for the report before going to bed, remembering 2011 tfn! A little bit of terrific in addition to enlightening post. I just genuinely widely used these products. With the help of using pick up penning listed here near. Keep switching spare. Congratulations you have achieved a good performance in the race . Great tour of 8 days. Really bike riding tour is a great experience for a person. Thanks for sharing it with us.